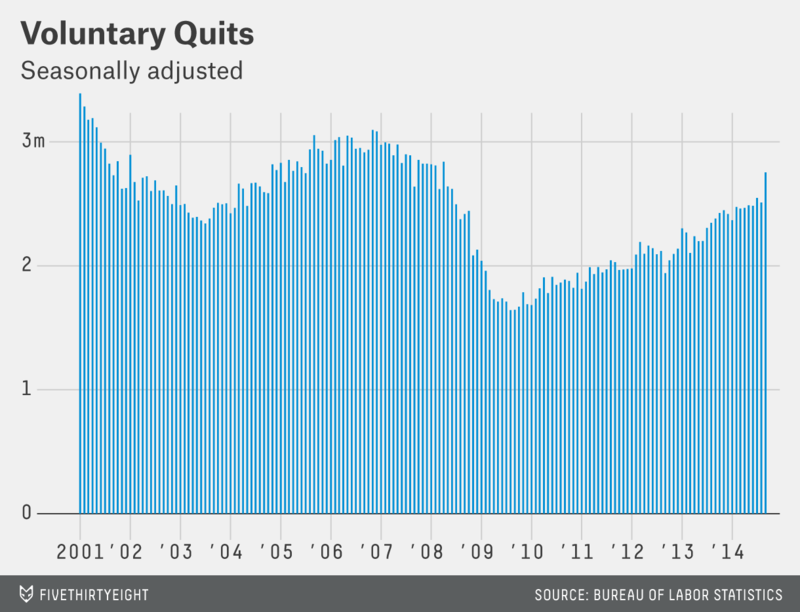 More Americans are quitting their jobs. That’s a good sign for the economy. Nearly 2.8 million Americans quit their jobs voluntarily in September, the Bureau of Labor Statistics said Thursday. That’s 10 percent more than in August and the most since April 2008. The September figure is preliminary, and the big jump could be a fluke, or perhaps a quirk of the government’s seasonal adjustment formula. But the long-run trend is unmistakable. Voluntary quits, which don’t include retirements, have been rising steadily for the past two years and are now back — more or less — to normal: September’s figure is almost exactly equal to the average level in the five years leading up to the recession. The rising number of quits is good news for several reasons. It’s a sign of confidence. Quitting your job almost always entails some risk, even if you have a new one lined up, so workers’ increasing willingness to do so suggests they think the job market is getting better. Changing jobs is also an important source of wage growth, particularly for younger workers. And job turnover of all kinds acts as a kind of lubricant in the job market, as employees who leave jobs create opportunities for others. Workers have good reason to be gaining confidence. Layoffs ticked up slightly in September but remain near an all-time low. The ratio of job-seekers to available jobs is at its lowest level of the recovery. And job growth has been steady. That doesn’t mean the job market is entirely healthy, but it’s certainly in much better shape than at any point in the past six years.